Photo from the Buccaneer Pirate Cruise site. When I heard that we were going to be going on a pirate cruise at Brandcation in Destin, FL., I was a little worried. I hardly ever dress up and was unsure of how the experience would go. I was even more unsure when I heard it was going to be the adult only version. My worrying was all for nothing though. From the moment I set foot onto the Buccaneer Pirate Cruise in Destin's Harbor Walk Village, I had an amazing time. The atmosphere was always charged and full of fun, the company couldn't have been better and I haven't laughed so hard in my entire life. 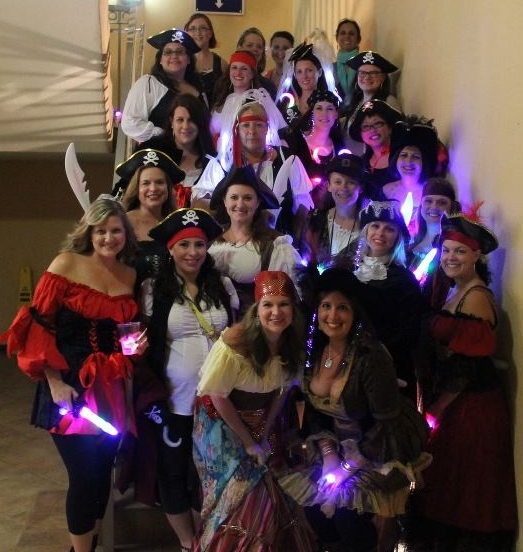 Before the cruise, all of us Brandcation girls headed to our rooms at the Emerald Grande Resort to get decked out in our pirate gear. Everyone met downstairs and looked amazing! Adding to the fun, were the tons of goodies we received from Flashy Blinky Lights. They have some seriously awesome stuff, like the light up sword, pirate hat and pirate hook I brought home to my boys. We took a group shot and then headed down to the Buccaneer Pirate Cruise boat, which is docked right at Harbor Walk Village at the base of the resort. On the way there, we were told all about the zipline that will be coming this summer to Harbor Walk Village. Can't wait to go back and try it! The boat is totally fun in itself. It is just as you would picture an authentic pirate ship to be. It has two bathrooms, plenty of room for large groups and an area that serves drinks, snacks and other refreshments. We were led to a reserved area on the ship, where food awaited us. The food was catered and provided by Jim and Nicks. It was good old southern food, including pimento cheese, chicken salad, pulled pork and chicken sliders with BBQ sauce, slaw, potato salad and some of the best chocolate cake I have ever had! It was all delicious and a huge thanks goes out to them for accommodating us. The games begun shortly after we finished eating and this is where the laughter began. I don't think it stopped either until we left the boat. Since this is the adults only version, some of the jokes were definitely off color, but all in fun and everyone enjoyed themselves. The games were also of an adult nature. Lynsey was the first to be chosen to participate and you can tell by the look on her face that she was thrilled. Paula and Joy took a turn at hoisting the flag. Joy and Trisha had a blast racing against some other couples in another game, and it was about this time that I was almost on the floor in tears. Blondie and Maggie had some fun all wrapped up trying to pop a balloon and then a lot of the ladies enjoyed some dancing until it was time to go. I could not have thought of a better way to spend the evening laughing and having fun with friends. It was definitely more fun than a crowded bar and the interaction was fantastic. 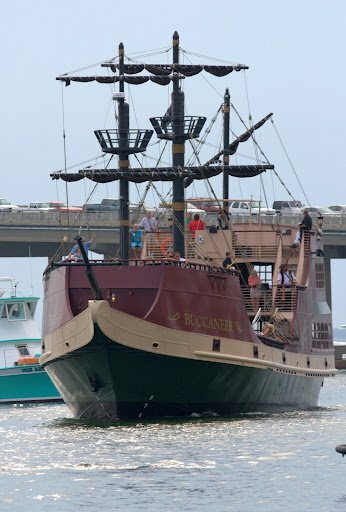 If you are visiting Destin and are looking for a way to spend a fun evening out, I cannot more highly recommend the Buccaneer Pirate Cruise. For those of you visiting with little ones, they also have a family friendly day cruise in which children and adults of all ages have fun playing games, learning how to be a pirate, participating in water gun fights, while traveling to find treasure! Prices for the Buccaneer Pirate Cruises start at $36 for adults and $20 for children, with children 3 and under sailing free, but there are often specials going on, so be on the lookout for those. Have you ever been on a pirate cruise? What was your favorite part? We were provided with free admission onto the Buccaneer Pirate Cruise in participation with Brandcation, but all words, thoughts and opinions are my own. It looks like such a fun time. One of our favorite things of the Disney Cruises we've taken is the Pirates in the Caribbean party - so I bet we'd love the family cruise! Lynda, you definitely need to make it to at least one Brandcation. They are smaller than normal conferences, but you still come away learning a lot an motivated to make big changes in the way you blog! Love all of these pictures. I absolutely LOVED meeting you, you are so cute and so much fun. Hopefully we will get to see each other at another event! I had no idea something like that existed but it seems amazing! I am pirate-obsessed & I would LOVE the adults-only version since that's the type of humor I love. I hope so Tiffany, you are a doll and your pregnant belly is adorable! Ok, that would just be the most ridiculous fun! I would do that in heartbeat!! So fun and such great pictures! This looks like such an amazing time! Wow! That looks like so much fun. You ladies rocked that pirate look! What a fun time and you all looked great! I would love to charter a cruise for a milestone birthday party. It looks like so much fun! Only thing missing is a pic of you in your pirate outfit! this was such a fun cruise. I laughed so hard.